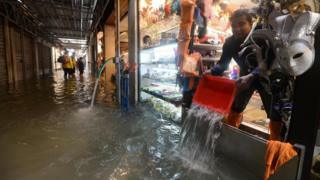 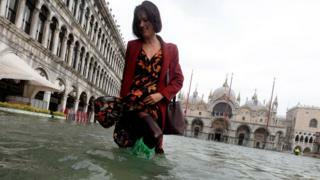 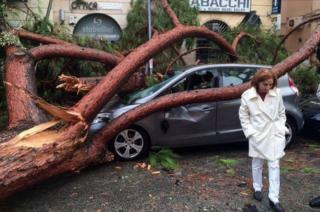 Italy has been battered by fierce winds and rain which have left 10 people dead in the west and north, while schools and tourist sites closed in se veral regions amid fears for people's safety. 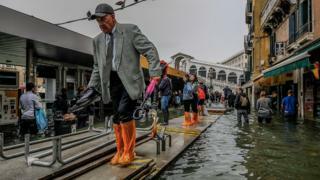 Some people took to the raised wooden walkways that are in stalled when there is flooding. 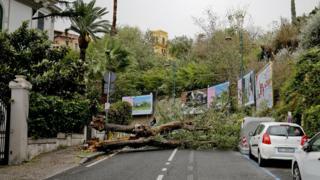 In the wider Veneto region, a man was killed by a tree and a volunteer fireman died in the north-eastern border region of Alto A dige, also known as South Tyrol. 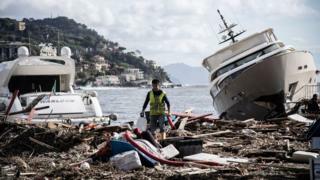 The outer breakwater wall in the fashionable port of Rapallo was destroyed as its reinforced concreted crumbled, causing damage to some of the prize yachts mo ored at the resort.